The Judy Dworin Performance Project: Developed in prison, staged Wednesday at the conference. Malloy has taken a maternal interest in Bernardi ever since they met years ago at York Correctional, the state’s only prison for women. Bernardi was doing time for murder. It is a relationship Malloy says is discomfitting to some friends, the ones who compliment her interest in the abstractions of second chances, while flinching at the realities, the idea that the first lady of Connecticut is comfortable getting in a car with an ex-convict. “I never thought about it. It’s never crossed my mind,” Malloy said. She said Tracie Bernardi is one of the inspirations for a conference that drew Valerie Jarrett, a former top aide to President Obama, plus the chief justices of Arizona and New Jersey, state legislators from Connecticut and elsewhere, policy makers and practitioners in the business of dispensing justice in the United States. The conference at the Hartford Marriott Downtown concludes Thursday. It is sponsored by eight Connecticut and national foundations, including one funded by the first family of arch-conservative politics, the Kochs. The governor, who typically is fighting Koch-supported candidates as the chairman of the Democratic Governors Association, made the solicitation. “I have to tell you, there are some pretty strange bedfellows in this space,” Jarrett said. Nationally and in Connecticut, many on the left and right have united behind the conclusion that the U.S. policy of mass incarceration was an expensive mistake, both for the governments that financed a prison building boom and the men and women convicted in an era of mandatory minimum sentences and, in some states, three-strikes laws that meant life sentences on a third conviction. Under Malloy’s husband, a former Brooklyn, N.Y., prosecutor and Stamford mayor elected governor in 2010, Connecticut has become a laboratory for criminal justice reform, for re-examining get-tough-on-crime sentencing practices that have given the U.S. the highest per-capita incarceration rate in the world. Scott Semple, the career employee the governor nearly overlooked for correction commissioner, has opened four community re-integration centers, places to prepare inmates to go home. He recently opened a special prison unit for inmates no older than 25 to test new ways of handling a demographic that tends to be the most troublesome. Malloy has won passage of laws reforming the bail system, decriminalizing marijuana and repealing mandatory sentencing for drug-possession crimes. Beginning last year, Cathy Malloy pressed her husband to organize a conference to celebrate progress and push for further changes. The time seemed right. Cathy Malloy watching the Dworin group perform. At lunch, the governor briefly sounded like a man thinking about his legacy. He is not seeking re-election to a third term in 2018, and is likely to leave office with Connecticut still struggling to stabilize it finances. But he has succeeded in reversing the growth of the prison system, shifting resources to rehabilitation as the state’s rate of violent crime has dropped faster than elsewhere in the U.S. He thanked Semple and Michael P. Lawlor, the former co-chair of the legislature’s Judiciary Committee who has been his criminal justice advisor for his six years as governor. And he thanked his wife, who was the executive director of a sexual assault crisis center in Stamford for 11 years before he became governor. His wife was introduced by Hartford Mayor Luke Bronin. Cathy Malloy talked about the need for society to overcome its fear of people leaving prison, looking to make a life. She described striking up a friendship with Judy Dworin, who established a performing arts program at York more than a decade ago. Dworin invited Malloy, who now is executive director of the Greater Hartford Arts Council, to a performance at York. Gov. 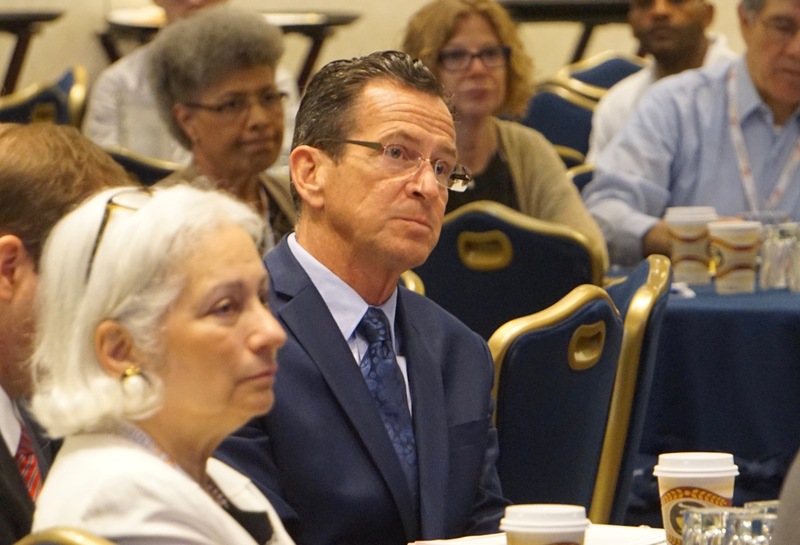 Dannel P. Malloy listens to a speech by his wife. Dworin’s troupe has performed at Hartford Stage and other venues. 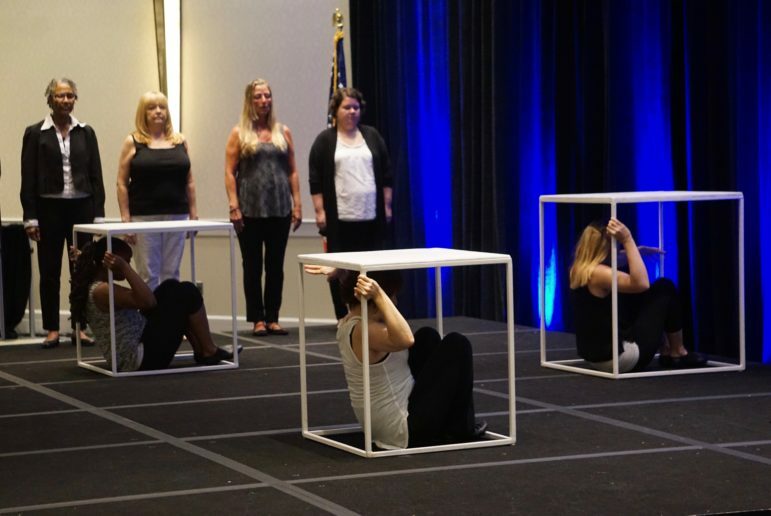 On Wednesday, they were featured at the conference, using song and monologues to talk about their paths to prison, lost years and the uncertain way home. Kathy Wyatt described her first job interview after more than eight years inside — how the manager of the women’s fashion store recoiled from her when she talked about prison, and the stares and whispers as she retreated. 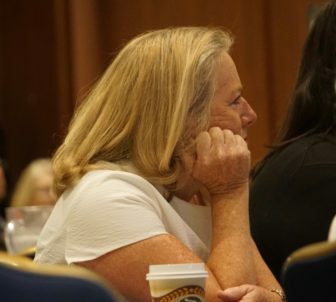 Cathy Malloy sat leaning forward, rapt. Later, she talked about the ability of someone like Bernardi to give voice to what it means to do time and emerge changed. Bernardi was locked up as a 19-year-old, one of four gang members in Waterbury who attacked and killed another young woman. Malloy said Bernardi was released in 2015 after 23 years in prison, with some college experience, bright and articulate. “I think she can really make a difference,” Malloy said. The first lady of Connecticut said at age 62, her three sons grown and launched in careers, she will try to help, too. She will remain active in the arts, but she increasingly feels drawn to criminal justice reform.